Hilton Warwick / Stratford-upon-Avon HotelHotel providing easy access from all major midlands road networks, sitting just off Junction 15 off M40, close to towns of Warwick and Stratford. 181 modern, well equipped ensuite, bedrooms many with airconditioning. Bedrooms all include tea and coffee, hairdryers, ironing facilities. Accessible rooms and disabled parking available. Bedrooms split over 3 floors including ground floor rooms. Special Christmas events and themed dinners throughout the year. 18 modern meeting rooms and banqueting space from 2 - 360 people, supported by a manned business centre. Modern Restaurant 360: Offering modern cuisine, 24 room service available and full bar and lounge offering range of snacks and meals throughout the day. Indoor Fitness centre with fixed equipment and free weights. Junction 15, M40. 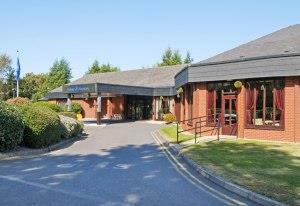 Take A429 for Warwick and hotel is situated 50 yards on left hand side of road.